Since the inception in the year of 2007, iPhone has completely transformed the way we work now. Along with the advancement in the technologies & boom in the tech-market Apple always comes with something new every year. We can clearly see that iPhone undeniably have transformed the living scenario of gadgets lovers. Apple keeps on updating & releasing its new versions for its users. It has recently launched their 12.0 version on 17 September 2018. Since Apple keeps on releasing its new versions every year, Apple’s OS brings some new challenges also for the iOS app developers with each newly released version. 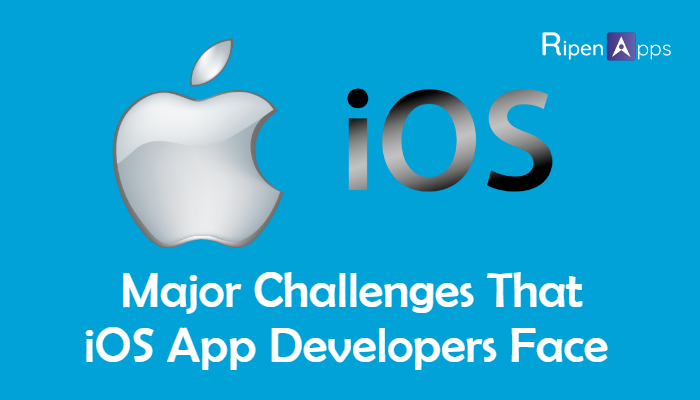 Let us have a look at those challenges that developers face at the time of iOS app development. Different Apple’s products such as iPhones, iPads, iPods MacBooks are available in the market and it mandatory that every developed iOS app is compatible with all the devices & Apple’s products. However, since Apple keeps releasing its new versions one by one, the more iOS developers are facing challenges in iOS app development. If we compare Apple to Android then the compatibility challenge is easy to solve in Apple. However, the roadmap for iOS app development is not as simple as it sounds. Well, in order to overcome this challenge, it must test an app by using TaaS product to identify the issue. Managing performance & memory limits are another iOS app development challenges come in the way of iOS app developers. Especially it occurs at the time when a developer manages the memory within an iPhone app as iPhone does not come with garbage collection. It causes the termination of the app if it becomes a source control. Since every device has its own memory restrictions, a single version of iOS faces generated problems in launching it with the latest version. Thus, a developer needs to attain into considerations the demand of the app. Network speed is such a big issue, the speed you are using might not be the same speed your end users are expecting from your end. The speed of the network can raise some concerns if you are incorporating videos & other streaming services that require a huge amount of data. This raises challenges for the iOS app developers to develop the apps so that the developed app can match the user’s need. However, the good news is that many of the companies such as Netflix have found out a viable solution by adjusting the quality of video in order to reduce data usage. Get the first thing clear in mind before launching the iOS app to the App Store that App store has some guidelines that your app has to testify before getting uploaded on App Store. As Apple store have some guidelines or rules, there is a number of reasons & it is important that one should aware of them. Once you have developed an app, you are not allowed to publish it on App Store instantly. You need to get an approval from App Store & try to avoid all the reasons for being rejected. This will not only save the developer’s time but also help through different investment challenges. A major disappointing factor for many app users & iOS app developers is the app performance. The users are not satisfied with the performance of the app, which they have installed on their devices. The main reason is that these apps are battery-consuming apps, as it consumes a lot of battery power, which results in the app’s un-installation. Therefore, it is advised to iOS app developers to develop the apps by using battery saving features so that apps consume less battery & yield a better performance. Most of the people are opting iOS devices due to its clean, intuitive design & excellent user experience. Therefore, once you are developing an iOS app, you have to keep your users in mind. The UI only shows the core features & functionalities in a process flow as developers can have constrained the amount of space. It is the biggest challenge to managing the limited amount of screen space with a hike in business expectations from iOS apps. The major & important factor is the app’s security that should not be compromised while developing the iOS apps. In order to protect app’s data from the hackers, Proper Data encryption is must including factor in app development. It can be challenging for the developers to put a higher amount of security because the hackers can be so smart. Mentioned challenges are not complete list that developers face at the time of iOS app development. Here, developers have to present a smart work & maturity by handling challenges with the minimum investment of time & money & compromising final product. Share your feedback or query on info@ripenapps.com. Radhika finds covering the tech world to be an exciting and engaging experience as each day brings new and groundbreaking technologies to explore and write about. A believe that words are our most inexhaustible source of magic, makes her fortify to writing pieces that enhance the visibility of any brand and helps them position themselves in the best possible way. We guarantee a much quicker and worth response. Why Considering ‘Cost Factor’ Is Not Enough To Hire A Mobile App Development Team? How “5 Star Ratings” on Mobile Apps Catches Users’ Eye? What Are the Preemptive Majors to Secure User’s Sensitive Data in App Development? Why Mobile Applications Are Must Have For Education Sector? Why Do Users Quit Apps and Never Come Back? How to Choose a Right Mobile App Development Partner?